Dennis Busby suited up in just two games last season, but the Flint Firebirds’ right-handed shooting defender left such an impression on the Arizona Coyotes as a 16-year-old rookie that they selected him with their fifth round pick in this past June’s NHL Draft in Dallas. After being one of the last cuts for Canada’s Under-18 Team last summer, Busby suffered a broken clavicle in the first game of the OHL Preseason Showcase at HarborCenter in Buffalo on Labour Day weekend, forcing him to miss nearly all of the 2017-18 season. Like another OHL defenceman in Hamilton’s (now Saginaw’s) Reilly Webb (6th round, Detroit) the year prior, Busby managed to leave an impression with an NHL club despite limited viewing. His play as a rookie that included 16 points (2-14–16) over 62 games in 2016-17 left Arizona wanting more. 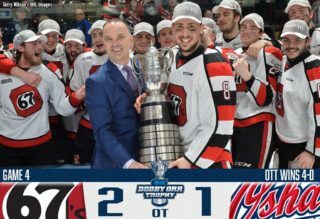 Busby’s positive attitude and team-first mentality throughout a trying season for both he and the club on the ice drew the admiration of head coach Ryan Oulahen who recently helped lead Canada to gold at the Hlinka Gretzky Cup in Edmonton. Busby, who grew up just outside of Barrie in Horseshoe Valley, was at home watching the draft with his family when the streaming feed cut out just before he was chosen at 145th overall. A friend quickly texted him the good news. 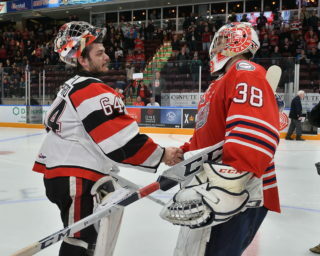 Busby had the opportunity to attend his first NHL Development Camp following the draft, spending time alongside fellow OHLers and Arizona prospects in Firebirds teammate Jalen Smereck, Ottawa’s Noel Hoefenmayer and Kevin Bahl, Guelph’s Nate Schnarr and Soo Greyhounds forward Barrett Hayton. 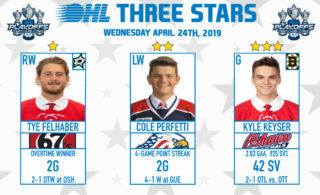 The 18-year-old will rejoin a Flint blue line that is a year older and more experienced to start 2018-19 led by Toronto Maple Leafs prospect Fedor Gordeev alongside other developing talents in Riley McCourt and sophomore Marcus Gretz. “We kind of told Dennis at the end of last season that we’re making a big acquisition over the summer and his name is Dennis Busby,” said Oulahen. “We were happy with the progression of some of our other defencemen last season and now being able to add Dennis to the mix gives us what we feel is an improved defence corps. 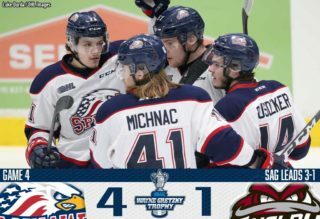 After being part of Flint’s first trip to the OHL Playoffs in 2017, Busby watched as his club missed the postseason last year. He returns to the Vehicle City optimistic and ready for action.